Are you looking at replacement conservatory roof systems for a home extension project in Surrey? Castle Conservatories works exclusively with a market-leading manufacturer of high-end conservatory roof systems. We offer a range of systems to suit the varying needs of our customers, so you’ll be able to find exactly what it is that you’re looking for. Our consultants can discuss which enhancements add to improve performance. To help make choosing your new replacement conservatory roof as easy as possible, we’ve created a brand new Virtual Reality Tool. Use this simple but effective app to explore our systems in more detail – on your laptop, mobile PC or tablet. Call Castle Conservatories today on 020 8669 1500 to discuss your requirements or send details of your enquiry to info@castlecon.com. There are different types or conservatory roof systems available, each of which comes with its own unique set of benefits. Which of our stunning products is right for your home in Surrey? Here are the three replacement conservatory roofs we offer. This is a tiled replacement conservatory roof that can also be glazed. This unique and aesthetically compelling system can be fitted with full-height glazing or, if you prefer, there are Velux windows. If you want total privacy, the roof can be tiled throughout. The choice is yours. You’ll have control over where and how the light falls with this stunning entry in our portfolio. And, because our tiled roof is lighter than any other tiled replacement conservatory roof on the market, it’s remarkably easy to manoeuvre on site and install. 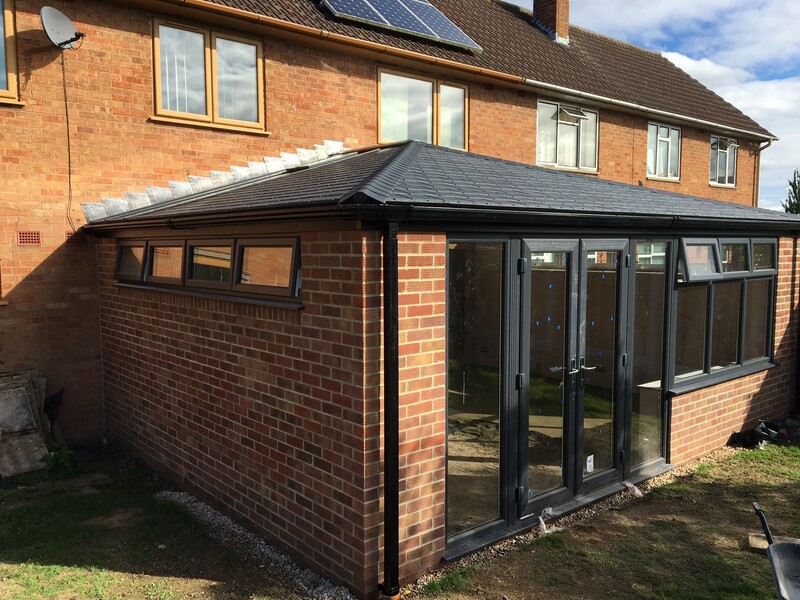 Our tiled conservatory roof is also designed to meet the requirements of planning permission and building regulations, so you won’t need to worry about red tape issues further down the line. Call for details today. Our solid conservatory roof shares some characteristics with its tiled counterpart. Its hybrid design means that its solid structure can be partly glazed, too. The main difference is that the glass can be placed anywhere in the structure of the roof – and shaped any way you like. Focusing light in one place has never been easier with this solid replacement conservatory roof. You’ll be able to turn a breakfast bar, table or seating area into a feature that will add a touch of style and character to your home in Surrey and impress any visitors. Our solid replacement conservatory roofs will make your new room comfortable and more like a natural extension of your property – as a result, rewarding you with a 24/7 living space. Why not step inside today by taking our new VR tour. If you want to create a conservatory that’s filled with light, take a closer look at this glass replacement roof. This system is also incredibly strong, withstanding wind speeds up to 130mph. 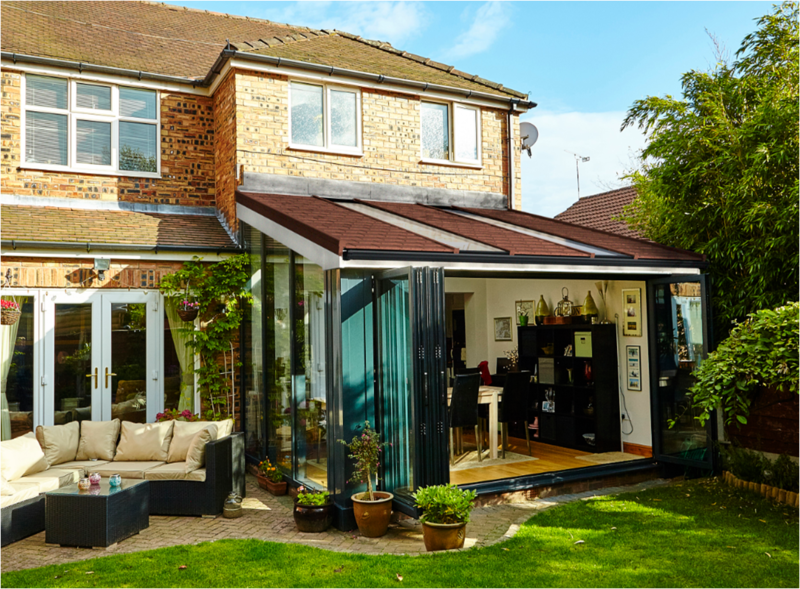 Should you want to open out your home in Surrey to your garden, our glass roof can accommodate wide spanning bi-fold or patio doors that will create remarkable views of the outdoors and fill your room with cooling breezes. A choice of stunning colours will be available. The appearance of your conservatory, orangery or extension will preserve for the lifetime of the product. Without the need to re-paint or foil over time. If you’re extending your home in Surrey and want to know the wider benefits of replacement conservatory roofs, here are three reasons to contact Castle Conservatories today. Market Appeal. By replacing your jaded and poorly performing conservatory roof, you’ll improve the market appeal and value of your home, as buyers will be able to see the greater developing potential. Additional Space. Your conservatory, orangery or house extension is no longer too hot during summer or too cold during winter. So you’ll be able to use it as a room for almost any purpose. Enhancements. Improve your replacement conservatory roof with super-insulated columns. Add style and improve heat retention or a decorative cornice that’ll hide your guttering from view. Find out about our range of replacement conservatory roofs by calling the Castle Conservatories team on 0208 669 1500. Or you can also get in touch by sending a message to info@castlecon.com. Don’t forget that you can take our Virtual Tour – from the comfort of your home or while on the move. And you can also get a free quote for your Surrey project by visiting our online conservatory roof design tool today.